Whilst there is a lot to do on-island, some visitors choose not to do too much. More relaxing activities include taking in the amazing scenery, wandering around Darlington learning more about the island’s history, and wildlife watching in between. High on the list of the Park Rangers’ manageable ‘must-dos’ are the Painted Cliffs and Fossil Cliffs – both easier short walks from Darlington. Tasmanian Aboriginal people will again be hosting Aboriginal cultural tours on Maria Island this Easter. For more than 50,000 years, the Tasmanian Aboriginal people managed and cared for this unique island. They saw changes in the landscape that we today struggle to comprehend. They adapted and they thrived. Knowledge is continuously passing through generations and we are proud to share this with you today. Join Tasmanian Aboriginal guides for a cultural tour as you discover more about the tyreddeme people of wukaluwikiwayna. The one hour tour will start at the Commissariat Store (11:30am and 2pm) between the jetty and Darlington on Maria Island. Tuesday 16th to Saturday 27th April. You’ll also be able to buy tickets at the Triabunna Visitor Information Centre, or on the ferry. Tickets are $25 per person, children under 10 are free. From a casual stroll around Darlington, to scrambling up boulders to the summit of Mount Maria, and just about everything in between, there are short walks, day walks and overnight walks to suit all levels of ability. As always, come prepared – food, water, suitable clothing, instagram account, etc. Limited untreated water is available at Darlington, French’s Farm and Encampment Cove. Detailed information on Maria Island walks can be found here. Bring your own or hire one through us, cycling around Maria is a great way to experience this island sanctuary. Once again, choose your own adventure – flat and easy, or steep and hard-going. Apart from a few Parks and Wildlife 4×4’s, there are no vehicles on the island – though the native hens (turbo chooks) do appear to be on wheels when going at full tilt. To reserve a bike or bikes please book online at least 24 hours prior to your ferry departure. A limited number of bikes may be available to hire on the day of travel – please call 03 6256 4772 or enquire in person. For more information about riding on Maria click here. A good amount of the north coast of the island is a marine reserve, and with that there are designated ‘fishing’ and ‘no fishing’ zones. The reserve therefore – among other spots around the island – is a great spot to explore the island’s marine environment. Pack your wetsuit, mask and fins, we’ll even lug your kayak across on the ferry so you can navigate the water, above and below. More information about the Marine Reserve can be found here. Explore Maria’s hidden coastline on a captivating scenic cruise. 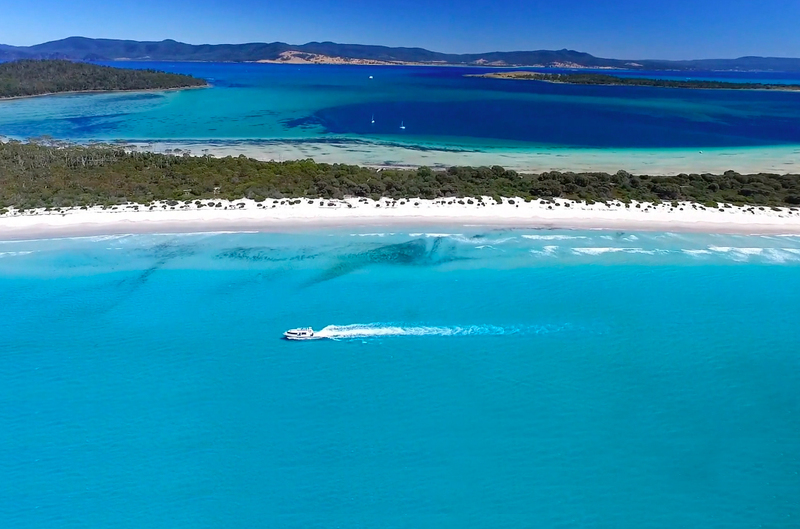 Combine time spent on Maria Island with a cruise to the Painted Cliffs, Fossil Cliffs, Riedle Bay, Ile Des Phoques seal colony and Maria Island’s south coast. Experience a gourmet lunch and local wines in one of Maria’s secluded bays. A scenic cruise is the perfect way to compliment your visit to the island National Park. A visit to Maria and a scenic coastal cruise can easily be done from Hobart as a day trip. Connections from Hobart are available. For more information about East Coast Cruises click here. Gray Line’s full day tour of Maria Island National Park departs Hobart at 8:15am and returns at 5:30pm. It operates Wednesdays, Fridays and Sundays from October 1 through to April 30.